Are you ready to signup? Welcome to round two of the #kittenmqs2016. Round one was a huge success without too much chasing of parcels and requiring angels to step in for flakers so I’m hosting round two but with a few changes. So let’s get down to the nitty gritty! Once you have registered your application, I and co-host Fiona from @bendigolioness will sort through, check the blacklist and allocate partners and groups. This swap is open to Australians ONLY – this is due to the mammoth task of chasing international parcels and the extensive shipping times. 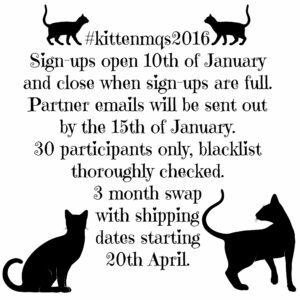 I will be running another kitten swap either later on this year or in 2017, and it will be open to ALL. I apologise profusely to all international friends who want to join in but its just not possible now due to so many variables. Your mission: You have just over 3 months to create a mini quilt to send to your secret partner. The theme is Cats and Kittens. Mini quilts are generally larger than 16in and no more than 24in but please use your judgement. 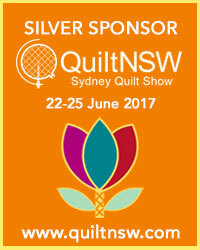 You are also required to make one smaller item – pincushion, zip pouch, basket etc Extras are encouraged, but not compulsory. Swap Info: Signups open on the 10th of January and close on the 14th or when signups fill up. Swappers will receive an email with their partner info on the 15th (and 16th if it takes us a little while to get through them). You then have from the moment you receive your partner’s info until the 20th of April to create a parcel to their liking. Swap tip 1: Read your partner’s info carefully. VERY carefully – we will be asking about allergies and this is important. 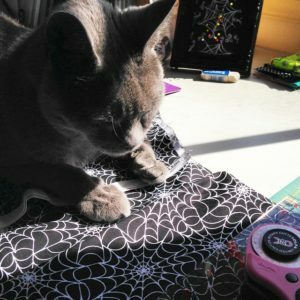 Swap tip 2: Post a mosaic with styles of quilts you like, cats you love and cat themed things. Everyone MUST post a mosaic to help guide your partner’s designing. Mosaics need to be posted on IG by the 20th of January. Swap tip 3: We will be checking in – dates TBA – progress shots will be necessary. Failure to comply will result in you being removed from the swap and your partner reallocated to those on the waiting list. Waiting List: Those of you who don’t make the final 30 will be kept on a list in case of flakers. You can choose to step in if we get in touch with you or say no. If you say no we just move onto the next person on the list. No problem.